If you read my last post for my chocolate coconut granola, you are probably aware that I’m on a bit of a snack kick lately. For me, snacks are a daily requirement. I try to have about 2-3 healthy snacks per day to bridge the gap between meal times and I find it really helps to manage the hunger levels, especially as a breastfeeding mama. But do you ever find yourself in a giant snack rut? Where you have all of this foods sitting in your cupboard or fridge, but you still don’t know what the heck to eat? I think we all go through this dilemma at some point or another. I found this to especially be a struggle during my pregnancy several months ago, primarily during the first and second trimesters when I was having MEGA food aversions. It seemed like all the foods I normally would go for just weren’t appealing AT ALL. Instead, I was desiring foods that were simple and crunchy. And that’s when I discovered roasted chickpeas. Roasted chickpeas were something I had always wanted to try, but never really got around to until one day I was experiencing that all too common snack rut and decided to pick up some of The Good Bean Roasted Chickpeas from the grocery store since I was in a rush and needed a quick snack option. Normally, I like to avoid packaged snacks and prepare snacks at home from scratch, but I wasn’t really feeling the whole cooking thing during that first trimester. Plus, the ingredients list on this product seemed relatively clean and healthy, so I picked up a package for on the go. So first, let me say that these things are ADDICTIVE! If you’re a fan of anything crunchy and a bit salty, roasted chickpeas will be your new best friend. In fact, these became a regular snack for me throughout my pregnancy. I set a goal of making them from scratch once I was feeling better since it was on my list of “must-test” recipes that I never got around to trying. It seems like this must-try recipe list is getting progressively longer as the days go by. With a busy baby, I definitely have to pace myself, although I’d test them all in one day if I could! So anyways, several weeks ago, I got to work and experimented with making roasted chickpeas and it turns out that they were a cinch to make and turned out even BETTER than the store-bought variety. I wanted to give mine a bit of a spicy kick so I incorporated some Sriracha hot sauce, but the options are really endless when it comes to flavour combos. The key to successful roasted chickpeas that aren’t mushy is to dry-roast them in the oven on a baking sheet BEFORE you mix them in with the olive oil and other ingredients. This will give them a chance to harden up and develop that nice crunch that we’re looking for. And here’s another tip! Try using a silicone baking mat. It can help prevent whatever you’re baking from sticking to the pan, which has to be one of the most annoying things EVER. These things are such a lifesaver!! So next, once you’ve dry-roasted the chickpeas, you can go crazy adding the flavouring agents of choice. This recipe calls for some Sriracha, garlic powder and salt to give the chickpeas a nice kick of flavour, but as I mentioned, you can really use any flavour combination — both savoury and sweet. 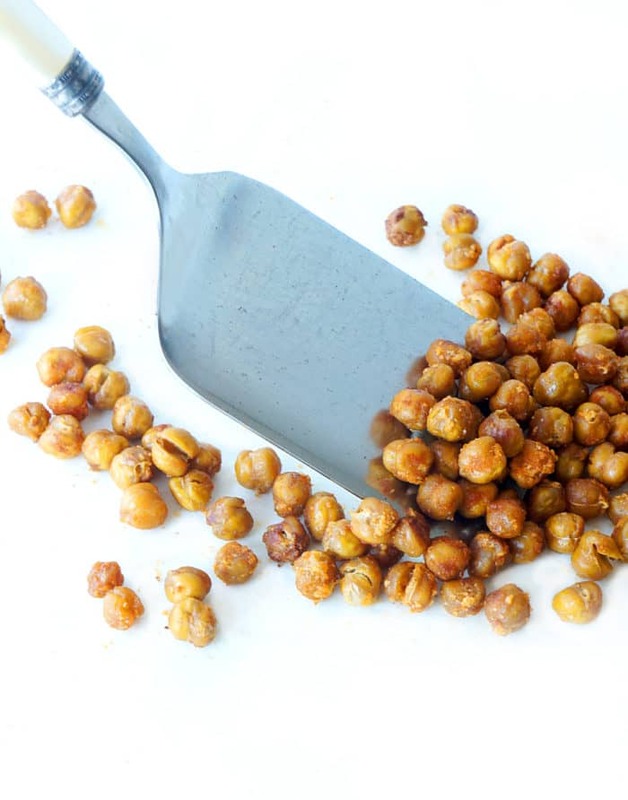 What I love about making roasted chickpeas from scratch is that you can add as little salt as you desire, so if you’re watching your sodium consumption, the recipe is totally adaptable! Additionally, chickpeas are a great source of fibre and protein, with 6 grams of fibre and 7 grams of protein per half cup serving. They’re also a source of iron, magnesium, folate and vitamin B6. So many amazing nutrients packed into this little healthy snack! 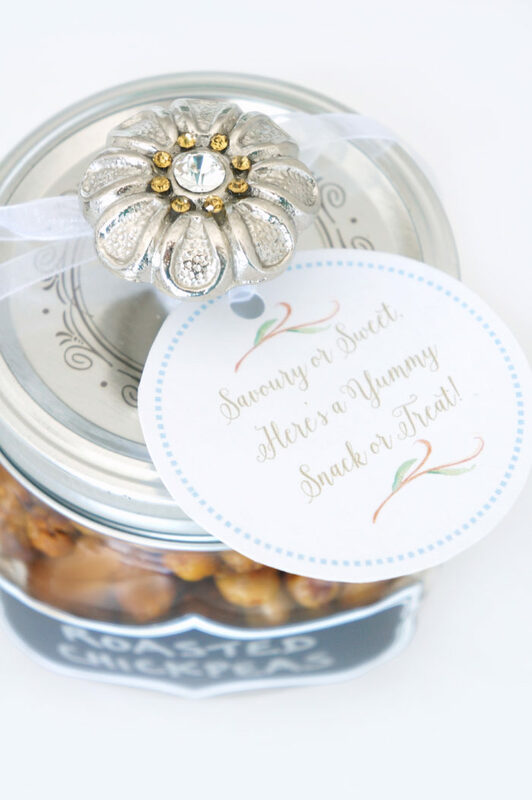 Similar to the granola that I posted the other day, it also makes a great edible gift option! As mentioned in my past post, next week, I’ll be showing you a little DIY project you can do that incorporates these roasted chickpeas, granola, and my recipe for spicy nuts! It’s super cute, so I hope you stop by to check it out! Drain and rinse chickpeas. Pour onto paper towel and gently pat them dry. Try to get them as dry as possible, as they will get more crispy in the oven if they're dry. Place chickpeas on a baking sheet lined with parchment paper in a single layer or try using a silicone baking mat. Place chickpeas in oven for 40-50 minutes (or until they're dried out), stirring or shaking the pan every 10 minutes. While chickpeas are in the oven, in a small bowl, whisk together olive oil, sriracha sauce, salt and garlic powder. Once the chickpeas are done roasting, transfer them to a medium-sized bowl and toss with sriracha mixture until evenly coated. Place the chickpeas back on the baking sheet and roast for 10-20 more minutes, shaking and checking them every 5 minutes or so. This next step is optional, but if you feel that the chickpeas could still harden up a bit more, you can turn off the oven once they're done roasting, crack the door open, and let the chickpeas cool down inside the oven. This will allow the chickpeas to continue to dry out if any moisture remains. Remove when cool and eat immediately or store in an air-tight container for 1-2 weeks. These look so yummy! 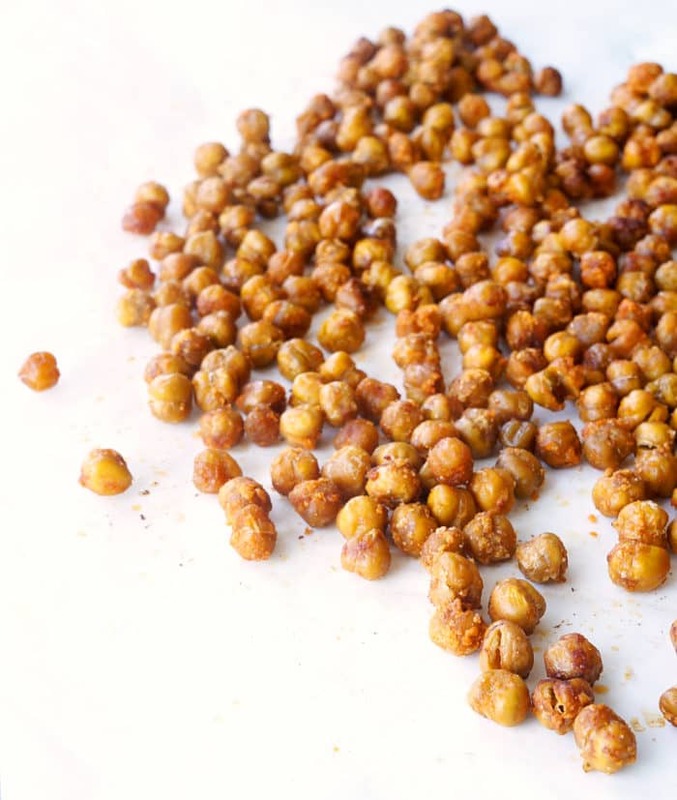 I love crunchy chickpeas but have never tried making my own. 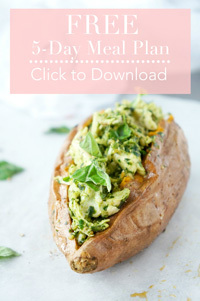 This recipe is super simple…which is my kind of recipe! 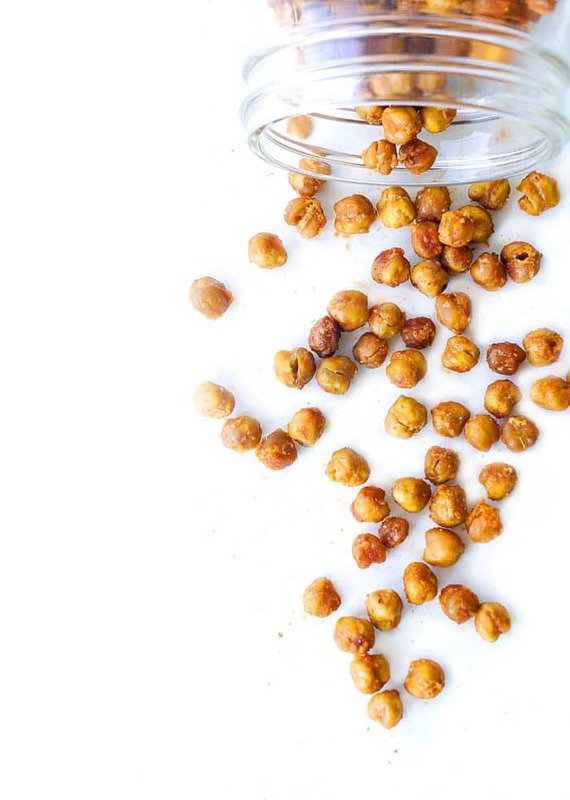 Roasted chickpeas are the BEST snack. Love the sriracha kick! My son and husband would LOVE these. I’ll print out the recipe! This sounds so flavorful and so good. I love oven roasted chickpeas. They are great for guilt-free snacking. Can’t wait to try your recipe. I love sriracha! 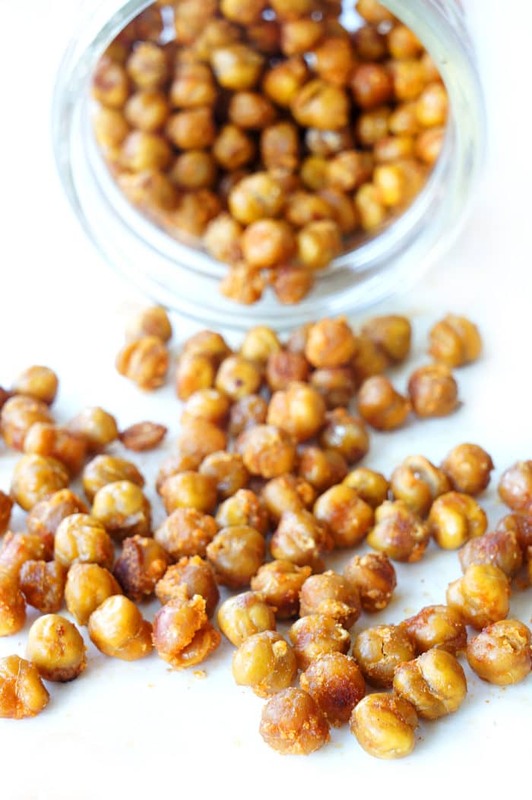 I LOVE snacking on roasted chickpeas! I’ve never tried making them myself though. Have to try this recipe!